amazingly high and definitely delicious! What a fun addition to the afternoon tea celebration! The menu for the Victorian evening began with a Caraway Tomato Soup. This was followed by a plate with assorted sandwiches which included Radish & Goat Cheese on Puff Pastry, Chicken Crescent Rounds, Cucumber and Dill Sandwich, Blue Cheese & Asparagus Rollups, Savory Cheddar on Pumpernickel, and Strawberry with Mascarpone Cheese. The scone course included fresh from the oven Traditional English Cream Scones (recipe here) and Lemon Poppy seed Scones served with cream, lemon curd, jelly, orange slices, strawberries, and blueberries. Dessert included a petite Raspberry Cream Tart with a pretzel crust, a chocolate brownie topped with a peanut butter rose, and Almond Sugar Teapot Cookies. Myra, of Places Through Time Living History shared some of her Victorian treasures, including a Victorian mourning bonnet, cameos, and assorted fans. This past week we were happy to welcome Victorian interpreter Myra of Places Through Time Living History to the tea room. Myra shared the protocol of Victorian etiquette including parasol flirtation to the distinction between her ball room gown (shown here) and the everyday dress. She shared the absolute essentials for every well-bred lady and gentleman. The basic rules include learning to govern yourself, to be gentle and patient, to never speak in anger, and to speak in a gentle tone of voice. Learn to say kind things and do not neglect the little things. Courtesy demands the return of all civil greetings and leads to a more pleasant and perfect world. Nothing wrong with trying to practice those basic rules in today's society either! She shared the language of the fan, and demonstrated some of the 'comments' a well bred lady might make with her fan. Resting the fan on the right cheek means 'yes' while on the left cheek it means 'no'. To say I'm sorry, draw the fan across the eyes. Fan very quickly to say you are engaged, very slowly if you are married. Everyone had the opportunity to practice 'speaking' with fans. Thank you Myra for an enjoyable evening. We held our annual Queen's Tea earlier this month to celebrate the birthday of Queen Elizabeth. Although the Queen's birthday is actually on April 21st, the 'official' birthday is celebrated on a weekend in June as the weather is more desirable and the celebration may include a garden party at the Palace. Therefore, we celebrate in June also. 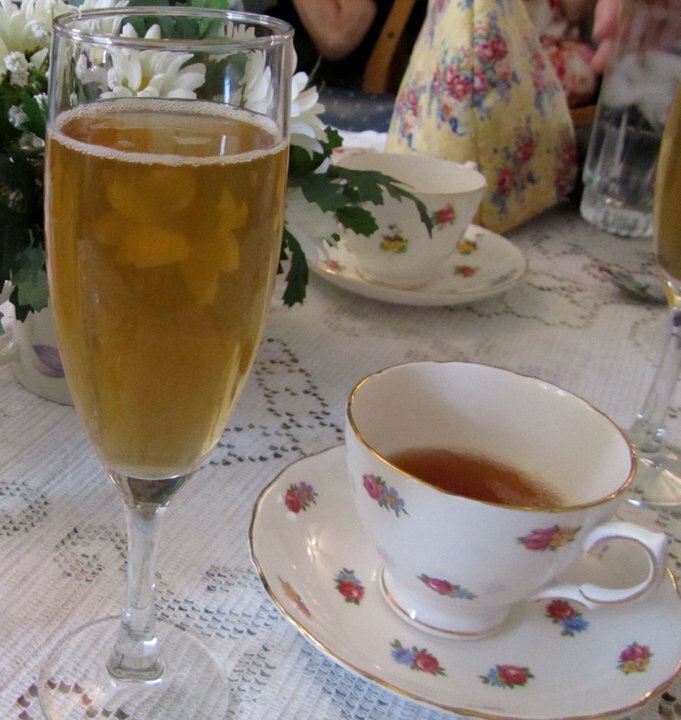 Our festivities began with a glass of Oolong Champagne and a celebratory toast, Long Live the Queen! For starters, we served a mixed salad with French Dressing said to be the Queen's favorite according to Darren McGrady, personal chef to Lady Diana, in his book Eating Royally. Following the salad, we presented the sandwich plate which featured a Herbed Party Triangle, Buckingham Palace Rose Garden Sandwiches, Green Onion with Boursin cheese biscuits, Peach & Brie Crostini, Chicken Salad in Tomato Rosemary Muffins, and a Bacon & Egg Salad Sandwich. The fresh-from-the-oven scones included Kensington Palace Scones (recipe can be found here) and Lemon Currant English Cream Scones accompanied with True Devon Cream, Mock Clotted Cream, Lemon Curd and Raspberry Preserves plus a Strawberry with Mascarpone Cheese. The desserts included a petite Chocolate Biscuit Cake (recipe from Eating Royally), Strawberry with Almond Cream Puff Pastry, and a miniature Earl Grey Tea Cake. Following the tea service, we shared what might typically be found in the Queen's purse, things such as pictures of her children, a collection of good luck charms, chocolate drops for her corgi's, and a crossword puzzle or two. This website, Lisa's History Room includes a detailed look into the contents of the Queen's purse. In a shallow bowl, whisk one egg. In a second bowl, mix 1/4 c. flour, chili powder, garlic powder, and salt. Toss young day lily buds in egg until fully coated. Toss into flour mixture and gently mix until covered in flour. Melt 1 Tbsp. butter in skillet. Saute floured buds, approx. 1 minute on each side, stirring until lightly browned. Serve as a unique and flavorful side dish. Three of the four Reppert sisters; Carolynn, Susanna, and Nancy, presented a Wild Foods Dinner and Program last week in the tea room. It was a wild time in the kitchen and in the tea room where a small group of adventurous diners feasted on wild crafted weeds. The appetizers included Pickled Day Lily Buds, Rose Hip Jelly over Cream Cheese, and Sheep Sorrel Spread with crackers presented on a huge Burdock leaf. A Weedy Green Salad featuring a variety of weed snippets such as lambs quarters (a slightly bitter weed), water cress (slightly peppery), purslane (delicate and moist), and wood sorrel (tart) were served atop local organic salad greens and garnished with raspberries, clover and violet blossoms (harvested in early spring and dried) and topped with a delicate honey, oil and vinegar dressing. Two types of 'Weed Sticks' accompanied the salad. A Weed Stick is made by mixing butter with the fresh weeds, spread on very thin bread, and lightly toasted in the oven. We served a combination of garlic chives and watercress on one, and wood sorrel and pepper on the other. The main entree was a Phyllo Ricotta/Feta Cheese Square topped with Garlic Mustard Pesto, Sauteed Day lily Buds (recipe to be posted tomorrow), a Warm Weedy Biscuit, and a Day Lily Blossom. The dessert was Mixed Berry Shortcake with almond cream,local strawberries tossed with finely snipped perilla (minty/basil flavor) and white violets. Beverages included iced water garnished with a leaf of fresh Mountain Mint, iced Sassafras Tea, iced Red Sumac 'lemonade', and hot Mountain Mint tea with dessert. An informative and entertaining slide show program presented by Master Gardener Carolynn (Carrie) Reppert Sears completed the evening. Our Wild Foods Dinner and Program was held this past week. One of the appetizers included pickled day lily buds. A quick and easy recipe, simply harvest young tender day lily buds and drop them in your favorite jar of pickle juice. Let them marinate and pickle for several days, and then serve with pride. Of course, if you harvest the buds, the summer blooms will not be quite as abundant. We also like to use the blossoms as a garnish, or even stuffed with a herbal spread and served with crackers as shown here. A simple baking powder biscuit with a few fresh herbs tossed in makes a tasty addition to a simple summer supper. Ready in a flash, give these a try and enjoy them fresh from the oven. Your family and friends will be pleased. Combine the flour, baking powder, sugar, cream of tartar and salt. Cut in the butter until the mixture resembles coarse crumbs. Make a well in the center; add milk, green onion, and fresh herbs. Stir until dough clings together. On a lightly floured surface, knead dough gently. Roll to 1/2 inch thickness. Cut with a round cutter. Reroll as needed. Bake for 450 degrees, 10 - 12 minutes (depending upon the size biscuit cutter you use.) Serve warm with butter. Aprons set the scene for the evening tea. Tucked here and there, attached to curtains, pinned to pictures, and placed about... it got everyone reminiscing about days gone by. This little cutie, covered in tea pots, was a bargain find at Michael's Craft Store, on sale for $2.50! It was a fun evening for every one! Recently we welcomed Janet Young, owner of the former tearoom Over The Teacup to Sweet Remembrances to present a unique program on Aprons. Janet is a lively presenter and everyone thoroughly enjoyed the tea party and the program. She began her history of the Apron with a reference she found in Genesis 3:7 where Adam and Eve realized they were naked and sewed themselves fig leaf aprons! She moved along in history to the Wild West where long prairie dresses required equally long aprons. Aprons were quite utilitarian and were used to protect clothing, carry veggies, kindling, or eggs. Aprons where used to clean hands, as a hot pad, or to wave her family in from the fields for dinner. Not to mention aprons provided a place to hide a rifle, and to wipe away tears when necessary. She continued the history of aprons through the 20's and 30's, mentioned the simple aprons and practical aprons of the 40's, perhaps even made of a flour sack to stretch the dollar. The 50's brought lots of colors and styles to aprons and reminded us of the TV moms that wore aprons such as June Cleaver. The 60's noted the decline of aprons, although you still might have stitched one in Junior High Home Economics class, they weren't necessarily used as often. Janet also included other uses of aprons, such as those worn by butchers, blacksmiths, etc. and the importance of an apron to protect clothing until the advent of washing machines. This is just a brief synopsis of her entertaining program. She had patterns, both old and new. She covered the different styles of aprons and invited participants to share a story of their own apron. There were many sweet remembrances shared this evening. The apron Nancy is wearing in the top photo was a gift from her pen pal Mikako when she visited the United States. Another guest shared the apron her father bought her while he was in a VA hospital. She treasures both his thoughtfulness and the apron. Thank you Janet for such an entertaining evening. Wow! What a night. Looking for some fun summer reading? Spend some time in the Sea of Galilee with the Grandmother of Herbal Medicine. In this wonderful book by Juliette de Bairacli Levy, Summer in Galilee, you will find Juliette and her two toddlers irresistible as they explore the Sea of Galilee (in the modern State of Israel) together. Summer in Galilee includes an herbal index by Susun Weed, photos from Juliette's archives, and stories that you will remember forever. Filled with historical tales and emotional adventures, Summer in Galilee is a classic that is passed along hand to hand and generation to generation. When you purchase this book today, Tuesday June 7th, you will receive dozens of wonderful downloadable bonuses that you'll love! 70 herbal partners are celebrating the life and work of the amazing Juliette de Bairacli Levy. Visit Grandmother Herbal Medicine (link here)to learn more. This fun book covers Juliettes' tales of swimming in the waters and history of the Sea of Galilee. You will hold your breath as Juliette dares to traverse the forbidden militarized zone around the Jordan River in pursuit of personal communication with this holiest of lands. 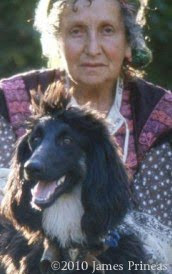 You will thrill as she and her children discover ancient treasure, be fascinated as she visits tombs of Jewish mystics and perhaps scream in terror as she is visited in the dark of night by an enormous snake -- only to breathe a sigh of relief when she is saved by her faithful Afghan hound. Juliette vividly describes her visit to a Bedouin village, and the trouble this causes, both in the Kibbutz, where she lives and among the Bedouins. But with keen wit, steely nerve and a kind heart, she manages to please everyone, including her readers as she saves the day and mends frayed tempers. It is a terrific book and today is a great day to pick one up as you will have the opportunity for over 70 downloadable gifts. Visit Grandmother Herbal Medicine and help spread the legacy of this amazing woman. We like to serve strawberry lemonade this time of year and stick with a quick and easy method. reconstitute the lemonade by adding fresh water and ice cubes to the juicy strawberry/powdered mix combination. Enjoy on a warm summer's day! It's always fun to try a new recipe from the Internet. The most difficult part is deciding which one to try. Sometimes that decision is based upon the ingredients on hand or the ease of the recipe preparation. Google Earl Grey Tea Cake and a multitude of options are immediately available, from cup cakes to tea cakes and more. This Earl Grey Tea Cake is quick and easy (recipe here). It uses tea bags which are handy when baking for a quick burst of flavor. The fine tea leaves are added directly to the batter for the cake and then additional tea bags are steeped in a small amount of water with confectioner's sugar for a sweet glaze that makes this cake extra moist. It should be noted that the baking time given for this recipe was insufficient. I found it needed almost an additional 20 minutes to bake and required lightly covering the top of the tea cake with aluminum foil to prevent excessive browning on top. The glaze was enough for two cakes and then some, so cut it in half (or even more) if you are only making one cake. It smells divine and has a delicate Earl Grey flavor considering how much tea is in the cake.